As home to the region’s environmental planning and science backbone organizations, the Center for Urban Waters plays a leading role in the restoration and protection of Puget Sound. 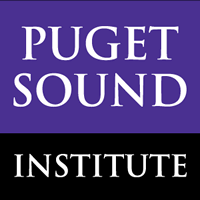 The Puget Sound Partnership coordinates planning and actions through its Action Agenda and the University of Washington’s Puget Sound Institute synthesizes and integrates natural and social science research into policy-ready technical guidance. Both organizations benefit by their co-location at Urban Waters with the innovative and collaborative City of Tacoma Environmental Services department. The Puget Sound Institute catalyzes the collective actions of scientists, engineers and policymakers to restore and protect the Puget Sound ecosystem by synthesizing and integrating research findings into timely foundations for informed decisions. The Encyclopedia of Puget Sound is a comprehensive guide to the science of Salish Sea ecosystem recovery. Articles on this site describe the region’s major environmental threats and areas of concern, but also the facts and stories that make the Salish Sea an estuary of international importance. The website is a product of the Puget Sound Institute and receives major support from the US EPA’s National Estuary Program.